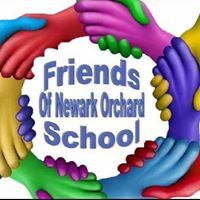 The Frie nds of Newark Orchard School is an informal committee whose members give their time to help organise and run fundraising events. This raises extra money for equipment and resources that the school needs. The purpose of Friends is to support the staff, school and most importantly the children. With such individual and diverse needs the Friends seek help from the Headteacher and staff to make best use of any funds raised. Last year Friends helped purchase sensory switch equipment, early year outdoor play equipment, football table, wooden disabled friendly outdoor bench, library storage plus resources and pay for arts week in school. Friends are always keen to meet new members to assist with organising and running events. Offering your time or skill is beneficial and welcomed by the group. The committee meet on a regular basis in school normally once a term and then out of school if we need to organise events over coffee!! Friends could not achieve what we do without the behind the scenes support that is offered. If you are interested in joining please pass on your information through the school office or e-mail Friends via the links below. If you don’t want to join Friends but wish to be kept up to date with information about our future fundraising this is also welcomed. Without your support we would fail to be so committed in gaining the much-needed items for the children. Follow us on Facebook it is the most up to date way of being in touch.